Minnesota Secretary of State, Steve Simon, abruptly cancelled an event to discuss election integrity scheduled for Tuesday, September 25 at the Roseville Library. Co-hosted by the League of Women Voters Roseville Area to honor National Voter Registration Day, attendees were stunned and disappointed by the sudden disappearing act by the highest election official in the state. Democrats are cowards. When confronted by those who oppose them, they will turn tail and run. Group think only works within the group.This was evident on Tuesday, September 25 at the Roseville Library where Steve Simon was scheduled to discuss election integrity at an event sponsored by the League of Women Voters (LWV) .Some attendees drove over an hour to attend and they had some hard questions regarding the lack of election integrity and voter fraud in Minnesota for the smooth-talking, Steve Simon. Minnesota Secretary of State Steve Simon will be MISLEADING voters again this week, this time at the Roseville Library, Tuesday, September 25th, from 6:30 p.m. to 8:00 p.m. at an event sponsored by the partisan League of Women Voters (LWV). This is a GREAT OPPORTUNITY for you to meet Secretary of State Simon in person and ask him about his failures to protect our election system and his false assurances that there is no ineligible voting, despite the evidence. Armed with a list of questions, supporters of the MVA were willing and ready to confront Simon. Just to be thorough, I did a quick Google search just to make sure the event was going to take place as driving in traffic to Roseville is always a hassle. The Lillie News Bulletin Board confirmed the event would take place. Upon arrival, we were suprised to find that Steve Simon and the LWV were AWOL. The evening wasn’t a total waste. The fearless Laura Loomer, armed with her cell phone, was ready to pounce on the unsuspecting Simon to question him about same day registration, voter ID, felons voting, etc. 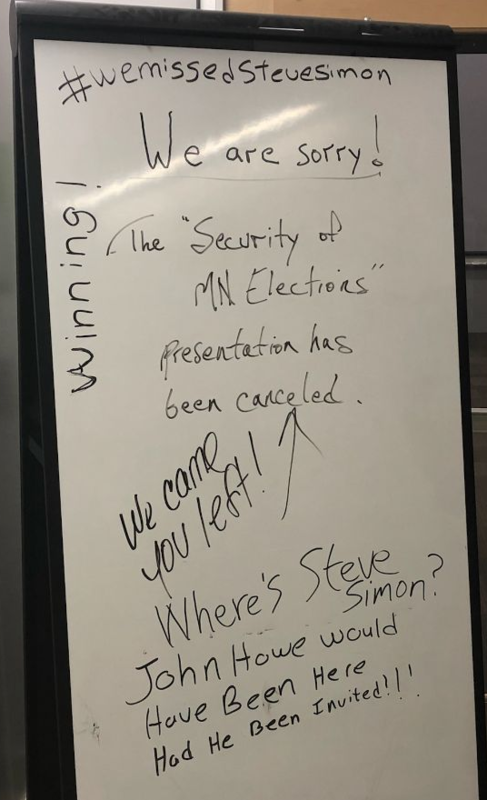 “Secretary of State Steve Simon in Minnesota is always complaining about his fear of voting machines being hacked, but he didn’t show up to his own planned event tonight about election security in Minnesota!,” said Loomer. Take a look at her video below at Loomer interviews attendees. Where are you, Steve Simon?